There is always an element of role-play in portraiture. When I paint myself I usually assume the rather obvious role of Painter, concentrating each time on different aspects of the identity it affords. When assuming any of these poses, one must be conscious of how clichéd they are; a certain level of irony and self-consciousness is unavoidable. But each time I adopt the role of Painter I also try and say something of what painting is, and of where I stand as a painter, that is honest and sincere. My Monkey Painting is intended as a homage to seventeenth-century portraiture, and to the humanistic aesthetic that underlies it. It is also an exercise in the genre of singerie or 'monkey painting'. This genre also goes back to the 17th century: monkeys were often portrayed in human clothes, performing human actions, and were generally symbolic of human foolishness and vanity. The best known examples are by Teniers, Watteau and Chardin. 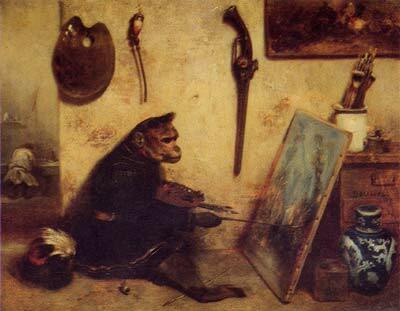 Monkeys were often shown painting, and associated with artistic activity, the underlying idea being that through art, man becomes 'nature's ape'. Ars simia naturae (art apes nature) - most often badly. 'Monkey painting' is thus par excellence the imitative art. I should say that I mean no disrespect to apes, which have appeared in several of my paintings, more as friends than enemies, symbols of our kinship with the natural world, and of painting as a natural activity. 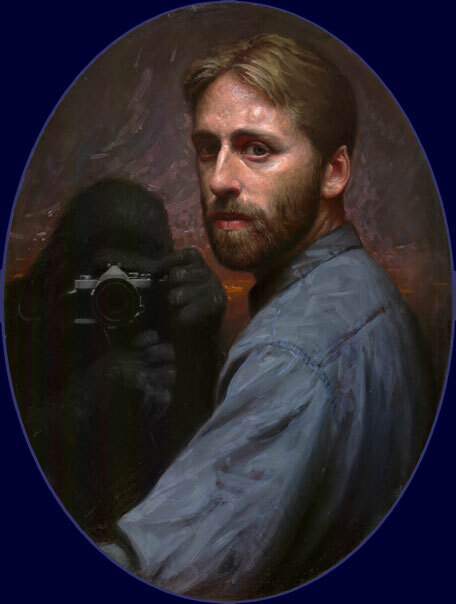 To judge by the literature there are still, among trained and captive primates, more amateur painters than photographers. But then, perhaps, the primates should be viewed as evolutionary reprobates who refused to come down out of the trees and embrace progress (as my mother always used to ask when the subject of evolution came up, "But why didn't the apes evolve any further? How did they get left behind?"). So I feel a strong kinship with the apes, being myself an evolutionary reprobate: a monkey painter, still aping nature when 'photography can do the job better', resisting new media, abstraction and the latest trends - a hopeless case!